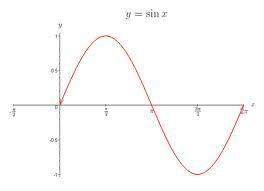 This entry was posted in Trigonometry and tagged fractions, physics, sine curve, trigonometry, video games by admin. Bookmark the permalink. 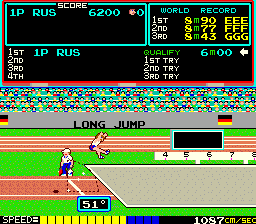 The example of the old Olympic video game with the long jumper is ironic, because I was just playing that precise game with my daughter over the weekend! You have to jump 6 meters in order to make “qualify” in the event and we were barely making it. I’ll have to share the result with her so we can compete with Carl Lewis next time. I’ll let you know if we set a new personal record. I used to compete in the long jump in H.S., but this fact was never explained to me. I should have asked my Physics teacher for his help instead of the rah rah track coach! I was too short for high jump, but the optimal launch angle must be different and perhaps an off-shoot of this equation.